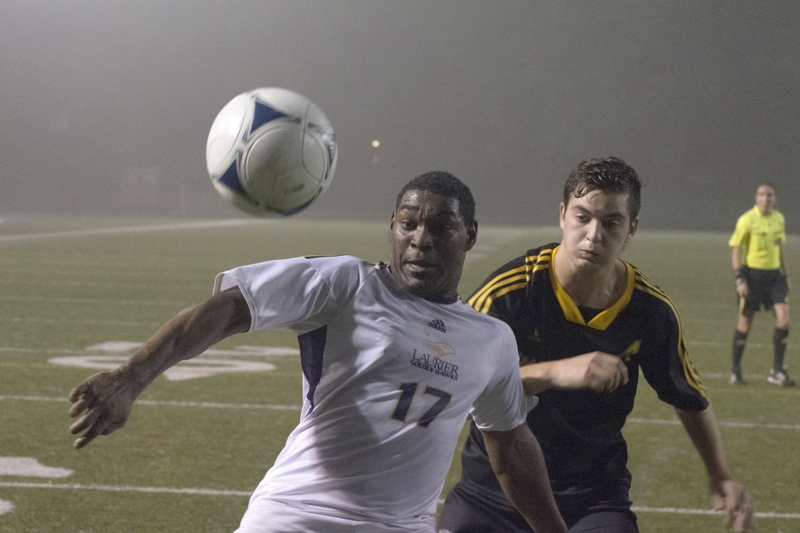 As they were about to face off against the Windsor Lancers, the Wilfrid Laurier men’s soccer team looked to carry the momentum from their last two games, a 4-1 win against UOIT and a 4-0 win against the neighbouring Waterloo Warriors. The Golden Hawks and Lancers had identical win-loss records going into this match (5W-2L-3T), with Laurier having the lower seeding in the standings because of the goal differential between the two teams. Laurier stood in fifth place in the Ontario University Athletics (OUA) West division, while Windsor was fourth. With an opportunity to overtake the Lancers in the standings and a chance to solidify a top-four seeding come playoff time, this match-up was definitely an important one. Unfortunately, the Golden Hawks didn’t capitalize. Windsor midfielder Christian Mayorga scored off a controversial penalty kick just minutes into the second half, and forward Leshorn Woods-Henry scored with ten minutes remaining to cement a 2-0 win over a Hawks team that was seriously outplayed for the majority of the game. The first half was characterized by back and forth play between the two teams. However, it was evident that the Lancers had the upper hand in ball possession. The Lancers’ superior defence was at its best, and was good enough to keep Laurier’s go-to scorers Adrian Bucksam and Matt Maughn in check. The second half saw much more action with Windsor’s two goals and some good scoring chances by the Hawks’ offence. Lancer goalkeeper Dejo Olagbegi played a great game and made some key saves in the last minutes — a nice pass by Hawk forward Jordan Kotsopoulos led Bucksam near the net, where he let off a bullet of a shot that was deflected out of bounds by Olagbegi. On the ensuing corner kick, the ball was headed towards what seemed to be an open net, but again, Olagbegi was there to make the diving save. Unlike their last two games, the Hawks just couldn’t put the ball in the goal. Even when midfielder Cameron Stephan was awarded a penalty shot in the game’s extra minutes, his shot rang off the crossbar, to the audible relief of several Windsor players. The match took a darker turn when Laurier midfielder Niklas Bauer, who scored for the Hawks in their previous game, sustained a nasty ankle injury while attempting to head the ball during a corner kick in the second half. He was on the ground in pain for several minutes after the play before being helped off by the training staff. Injuries have taken their toll on the Hawks all season long, to the point where coach Halapir was forced to dress 17 players against the Lancers instead of the usual 18. The schedule doesn’t get any easier for the Hawks, either. The team’s next game is against the nationally ranked York Lions, who punished Laurier 7-0 last time they played on Sept. 22. Their three games after that are against Western, Brock, and Guelph – teams that Laurier hasn’t beaten yet this season. Laurier is on the road until Oct. 20 when they return home to play McMaster for the final game of the season. Game time is 3:15 p.m.